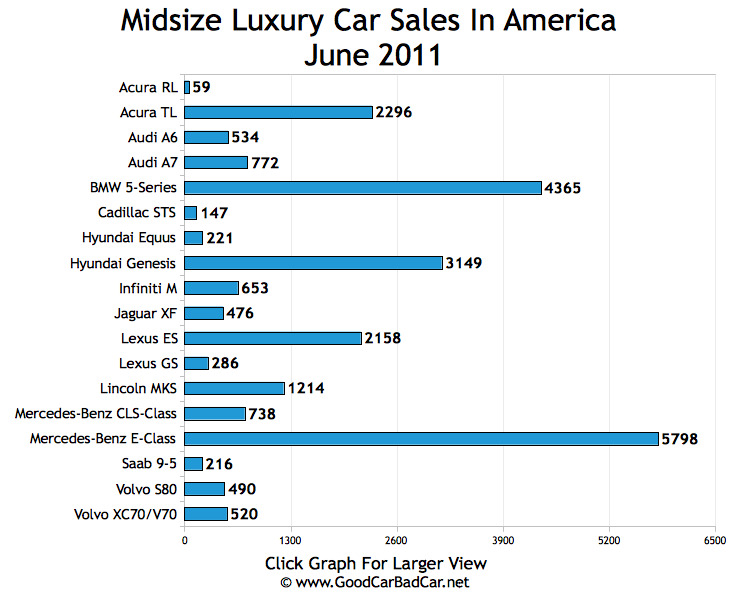 Midsize luxury cars, like any vehicle category I suppose, represent every subsection of the style spectrum. You’ve got your ugly, the Lexus GS. There’s the curvaceous Infiniti M and the classy Jaguar XF. The Lincoln MKT has a wonderful body but a challenging face. Then there’s the Acura RL which is, on design terms alone, one of the most boring cars on sale today. For most car buyers, design isn’t everything. They want a high quality car, decent performance, and the knowledge that they’re getting what they pay for. Problem is, outside of the RL’s design, it’s not exactly about to light your pants on fire with performance, interior design, or value. It costs $47,200. And sales fell 64% from a terribly low 163 in June 2010 to 59 in June 2011. It’s not as though the current W212 Mercedes-Benz E-Class is a perfectly clean and crisp effort, but it’s not dull, and it’s not ugly. Sales in June rose 19% to 5798. That’s nearly 100 E-Class Benzes for every single RL. No direct RL rival sold in lower volume than the RL itself last month. Year-to-date, the Acura RL is down 5% to 825. That’s roughly the number of E-Class Benzes Mercedes-Benz sells every four days in the United States. It doesn’t hurt that Mercedes-Benz sells the E-Class in four different bodystyles with four different engines. There’s no law stopping competing automakers from doing the same, though. 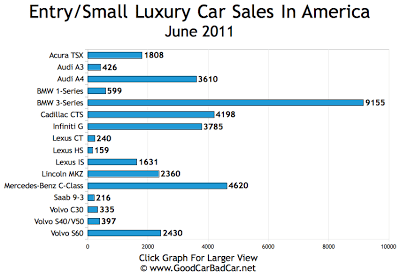 Rival automakers have been able to take advantage of declining Infiniti G and Lexus IS sales to land higher spots on the Team-Up-Against-The-3-Series chart below. Infiniti G sales slid 26% in June; the Lexus IS was down 43%. 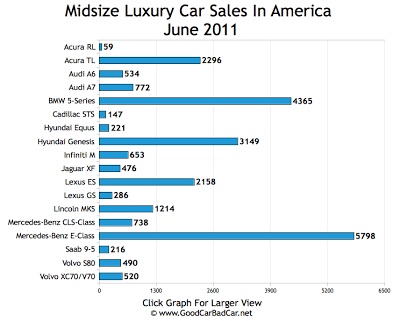 30% of the Infiniti Gs sold in June were Coupes. 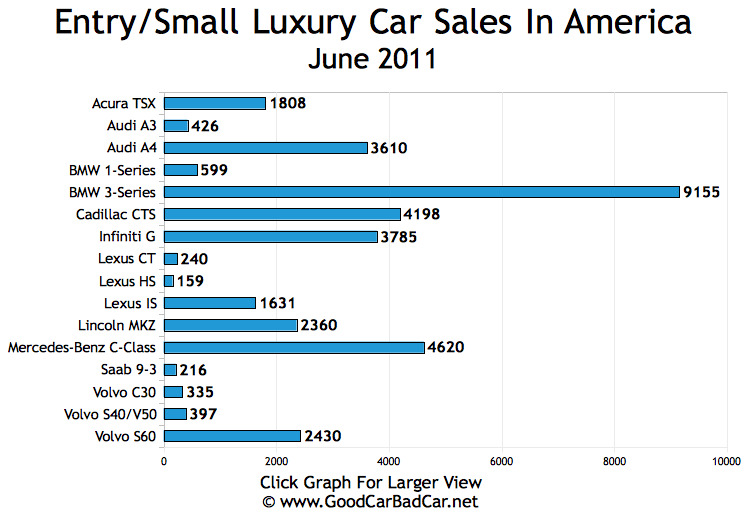 The IS accounted for 17% of all Lexus sales in June 2010. This year that figure fell slightly to 15%, a sure sign that the IS wasn’t the only Lexus model affected by the troubles facing Japanese automakers. Meanwhile, the BMW 3-Series, a car which we expected to struggle to match 2010’s volume, hasn’t struggled all that much. Sales are down 7% this year. But in June, 3-Series sales jumped 27%. The Audi A4 was up 15% last month. Sales of Cadillac’s CTS, though up only five units in June, are up 42% this year.